The Cohos Trail system begins on the Davis Path at Notchland parking lot in southern Crawford Notch. Cross the Saco River on a new cable-stay bridge and begin a rigorous climb for two hours to the summit of a 3,000-footer with a world-class view: Mt. Crawford. 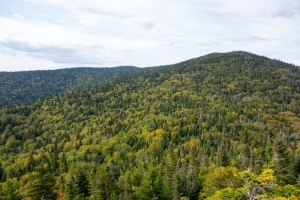 The little peak is perfectly situated in the White Mountain National Forest to take in almost all the terrain that can be viewed in the Forest from such a low elevation. The Owls Head trailhead is just off Route 115 about a mile southwest of the junction with Route 115A in Jefferson township. Park at the lot and take a lazy woods walk for a few minutes until the trail begins to steepen moderately and then more steeply as elevation is gained. After a good hour’s uphill pull, reach the expansive summit ledges with their spectacular view to the east to the western wall of the northern Presidential Range. Want more? Drop down Martha’s Mile and climb to the summit of Mt. Martha and its view of the Franconia Range from just below the site of the old fire tower (dismantled). The 6,000-acre Pondicherry Wildlife Refuge is a gem of a wetland reserve, the remains of a glacial lake bottom. Spend the day exploring the Slide Brook Trail, Presidential Rail Trail, Little Cherry Pond Trail, Ice Ramparts Trail, and Col. Whipple Trail. All thread through an exceptional wildlife habitat and all are ringed by majestic peaks and ranges. Many feature great marshes teeming with birdlife. 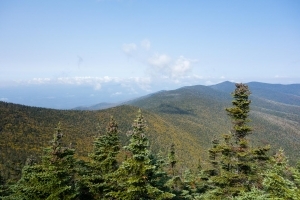 The Cohos Trail utilizes the Kilkenny Ridge Trail in the Kilkenny division of the White Mountain National Forest. 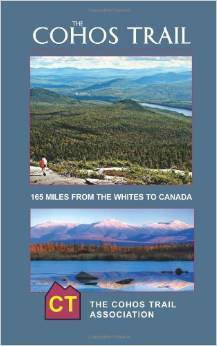 Travel to the York Pond trailheads in the Kilkenny five miles south of Route 110 and locate the trailhead for the Bunnell Notch Trail and the Unknown Pond Trail. Depending on which direction you pick, take those trails, coupled with the Kilkenny Ridge Trail on the highest terrain, and make a day-long circuit of mountains in the lofty Pilot Range including 4,170-foot Mt. Cabot, and the sensational summit known as The Horn. The Horn offers one of the more stunning views in the entire northern region. 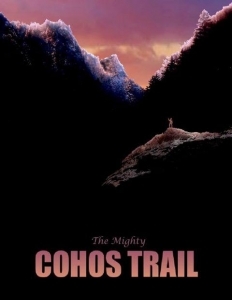 The Cohos Trail Association built or restored a number of trails on the conspicuous and steep Percy Peaks in the Nash Stream Forest north of the White Mountains. You can make a half-day loop hike to both North and South Percy Peak summits by following the Percy Loop Trail to the upper end of the Percy Peaks Trail. Ascend to the bald summit and blueberry barrens atop North Percy. Then come down and swing up the South Percy Peaks Trail. On the way down, get back to the Percy Peaks Trail and descend into the valley to the Nash Stream Road. Turn north (right) and walk back to your car, a mile away at the Percy Loop trailhead. There are a good number of mountains named Sugarloaf in New England, but this one is in the Nash Stream Forest at Mile 9 on the Nash Stream Road. Cross the big bridge over Nash Stream and locate the trailhead on the left 100 feet beyond the bridge. Walk uphill past a camp and pace through a little field. Reach a junction. Stay to the right and begin a moderately steep ascent of the 3,700-footer, pulling steadily uphill the entire way. Pass the old fire warden’s rotting camp and soon reach the summit ledges with their sweeping vistas in all directions. Just before crossing the big bridge over Nash Stream at Mile 9, pull over and park. Walk toward the bridge, but keep right and follow the stream north into the woods. Meander through beautiful woodlands near Nash Stream Bog, eventually reaching the Nash Stream Road. Turn south on the little-used road, and walk three miles back to your car, passing small summer camps dotted along the way and views to the east over sprawling Nash Bog. At Mile 11 on the Nash Stream Road, come to a parking spot at the Headwaters Gate next to the last camp in the valley. At the split in the road here, stay left and enter the Gadwah Notch Trail. Begin an easy to modestly steep trek uphill to beautiful Cathedral Meadow. Pass it and half a mile later reach Moran Meadow. Turn uphill for another half mile and wander into Muise Bowl. Cross the Bowl and meander uphill continuously on a soft old logging-lane-turned-foot-trail and reach ever higher narrow meadows until you reach Bulldozer Flat at nearly 3,000 feet of elevation with its beautiful views to the west. If you have to more miles in you, continue through Gadwah Notch, descending into Sims Stream Valley, then climb 3,097-foot Baldhead Mt. to the Baldhead Shelter and its 40-mile viewpoint. Spend the night in the shelter, or return the way you came. 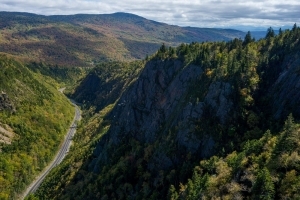 Some of the most dramatic scenery that can be had in the Northeast resides in Dixville Notch. The mountains and high ridges carry a system of trails that continuously reach cliff faces, pathways including the famed Table Rock Trail, the Three Brothers Trail/Cascade Trail, and the Sanguinary Ridge Trail. Once at the base of the latter pathway, walk down the entrance lane to the Balsams Grand Resort Hotel, swing around the inn and trek the hotel service road out to Route 26. Turn west a minute or two and look for the Table Rock Trail on the left. There are several trailheads and parking areas to take advantage of, but the trail loops completely around the notch and will get you back to where you started. One of the most popular trails we have developed in the entire region is the Falls in the River Trail. Begin at Second Connecticut Lake Dam and walk south into the woods. This is an easy woods walk along the wild Connecticut River. It reaches quiet backwaters and chattering streams, but the real prize is a big granite shelf that juts out into the roaring falls in the river above a narrow gorge and turbulent flume of foaming water. The Cohos Trail Association has restored a number of trails in Coos County, NH, and this is one. It begins on a spur road off Sophie’s Lane west of Deer Mountain Campground about four miles from the Canadian border. Walk Sophie’s Lane half a mile until a spur lane rises on the left. Walk up it until it ends. The trailhead is on the left (west) in a small turnaround lot. Begin an easy to moderate climb in quiet woods, crossing three streams as you climb higher. In less than an hour reach a high elevation drained bog in boreal forest. Now begin to climb more steeply and reach a narrow waterfall. Crest the summit ridgeline and walk north on the ridge until the steel superstructure of an abandoned fire tower comes into view. This is the summit of Deer Mountain, a spot that seems far removed from anywhere. The Cohos Trail system ends on the short but briefly steep Fourth Connecticut Lake Trail, protected by the Nature Conservancy. It reaches the little two-acre fen high on Prospect Hill that is the headwaters source of the mighty Connecticut River. 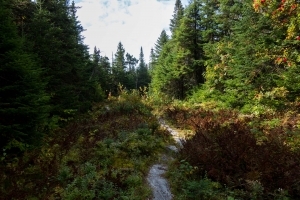 The pathway reaches the little pond in less than half an hour, but the trail makes a complete circuit around the watery environment in true boreal forest. EASY Usually short in distance and level or moderate inclines. All ages can manage these day hikes. MODERATE Several miles generally, with level or moderate terrain. Suitable for all but the youngest children. Carrying water is advised. LENGTHY Trail is not terribly difficult but is many miles long, usually at least seven or eight miles in length. Not recommened for the elderly or young children. Carrying water is essential. TOUGH Marked by moderately steep to steep terrain. Managed by most people in reasonable condition but difficult for those who are out of shape. Water and food are a must. STRENUOUS Steep terrain usually over moderate to long distances. These routes are best for folks who are fit and who are well supplied with water and food.